Humans didn’t come to this rock looking for a war, but that’s what they got. Sure, everything started off fine. Scientists had discovered a powerful new fuel source, Xenium, which, once refined, would make exploring the far reaches of the galaxy a reality. Problem was, it could only be found deep below the surface of PK-L7, a small planet floating out in the middle of nowhere. Still, the value of the Xenium was too great to ignore, and money is a pretty strong motivating factor. Soon, a small mining base was being built on PK-L7 and Civilians from all over the world were being shuttled out there to extract the dark, oily soup. Along for the ride were a bunch of hardened international Soldiers, just in case. There was a lot of money on the line and it made sense to protect the investment. It was in the deep, winding tunnels where the first attacks occurred. Most of the miners were killed, but those that survived told stories of primitive, aggressive creatures, which would become known as Xenos. These monsters followed the survivors back up to the surface… to the base. In Zombicide: Invader, 1 to 6 players take on the role of Survivors in an isolated space outpost. They will have to work together if they hope to live through the Xeno onslaught and get back home to Earth one day. Zombicide: Invader is played over a series of different Missions or in one-off adventures. Players work together to complete objectives, and winning or losing depends on whether or not they’re able to finish the required tasks. The ruleset can easily be picked up by anyone, even if they’ve never played a Zombicide game in the past. Invader introduces some rule changes that streamline the game and allow players to get right to the action. The mining base on PK-L7 is a much more open environment made up of large Rooms and connected Corridors. There are fewer doors and tokens to place than in earlier versions of Zombicide. The remaining doors don’t require a dice roll to open them. Each Survivor can open or close one door for free during their activation. In Invader, opening a door no longer triggers a Spawn. Further simplifying setup, there are fewer Spawn tokens to place at the start of a game, but the Xenos appear in greater numbers. Spawn cards only feature one type of Xeno on each card, with only their numbers changing based on the Danger level, making for much faster reading of the cards. As well as the new way the Xeno deck works, the Equipment deck has also been altered to include a greater amount of powerful weapons, giving a greater chance for the Survivors to find helpful items faster. All of these minor changes result in faster setup time and shorter, more exciting Missions for the Survivors without sacrificing gameplay. Speaking of Survivors, this new futuristic team is made up of two distinct groups. Civilians just came to PK-L7 to do a job. They received only basic combat training and are not protected by heavy armor, making them more vulnerable to the Xenos’ attacks. However, they are better at Searching the base for Equipment and Weapons, finding useful items no matter the room. Soldiers, in contrast, have seen a fair share of war in their time, but nothing could fully prepare them for the mindless assault of the Xenos. They are geared up with special armored suits, allowing them to take more hits from the Xenos, but they are only able to Search for items in Security Rooms. Each round, players activate their Survivors and spend actions to move around the board, kill Xenos, and perform tasks. The more effective the Survivors are at killing off the Xenos, the more experience they will gain, unlocking new skills and abilities (more on those in a future article). However, as their experience level rises, so too will the Danger Level, and more Xenos will be attracted to the turmoil. Once all of the Survivors have been activated in a round, the Xenos will have their turn to either close the gap between themselves and the Survivors, or attack them if they’re in range. Not much is known about the Xenos. However, scientists have been able to identify four distinct breeds among them and have determined that they are also not native to PK-L7. The grunts of the Xenos, referred to as Workers, appear in the most numbers. Although they are clearly the weakest of the bunch, they can still easily rip a human apart. The Workers tend to attack in groups, and while they’re easy to kill, they’ve been known to quickly overrun a team of Survivors. Larger Xenos have been nicknamed Tanks. These brutes shrug off most attacks and deliver blows that can tear through armor in seconds. Xeno Hunters clearly have a killer instinct. They are more cunning than the other breeds, hiding behind their allies in order to avoid attacks, making them harder to target. These predators leave little doubt that their function is to seek out and destroy humans. Rounding out this gang of killer extraterrestrials is the Spoiler Abomination. These hulking monsters require a lot of firepower to put down. They plod through the base, shrugging off most attacks. Survivors will have to combine a discarded Canister with a Flamethrower to create Hellfire, or Concentrate their fire to bring them down. However, slaughtering the human forces seems to be a secondary motivation for the Spoiler Abominations. Wherever they go in the base, they leave behind a terrible and dangerous Mold. This biological scourge spreads throughout the base and threatens Mission objectives and the very survival of the humans. Mold is a corrosive, sticky, slimy substance spread throughout the base by Spoiler Abominations. It can be either Active or Inactive, impacting its properties and the way it affects the base. All Mold removes Door and Objective tokens in a Zone when it’s first applied. Losing an Objective in this manner can even cause the Survivors to lose the game, so Survivors will have to fight it back with their trusty flamethrowers. Mold eats away at the walls, causing any covered wall to be considered as having an open access. A Zone covered in Mold cannot be Searched and loses any special properties it may have had. An Active Mold Zone can also become a Xeno nest spawning new Xenos into the base. If enough Mold has spread throughout the base, and two Spawn Zones are linked by an unbroken chain of Active Mold, the Mission is immediately lost. In Zombicide: Invader, the environment itself is an important element. The cold reaches of space are harsh under the best of circumstances, but when facing an attack by aggressive Xenos, the Survivors are going to have to take advantage of special building Zones within the base and even venture outside onto the planet’s surface to complete their Missions. In Oxygen Supply Rooms, Survivors will be able to acquire Oxygen Tanks, a necessary piece of equipment if they hope to travel outside the controlled atmosphere of the base. Airlocks are the frontier between the base and the surface of PK-L7. Certain Mission Objectives or in-game situations will force Survivors through Airlocks into Exterior Zones. While the humans need an equipped Oxygen Tank to exit the base, Xenos have no such requirements, moving through Airlocks at will. To further complicate matters, bullet-fed weapons and flamethrowers won’t work on the planet’s oxygen-starved surface. Only advanced prototypes will be effective outside the confines of the base. Players will have to take advantage of weapons like the Prototype Machine Gun or the Prototype Assault Shotgun. These futuristic firearms do not possess their own power source and require an equipped Energy Cell attached to turn them into effective killing machines. It’s enough to make a Survivor wonder if all this scientific advancement was worth leaving the safety of planet Earth. If science got them into this mess, maybe it will help them out of it as well. Survivors have at their disposal two advanced robotic Machines that can be remotely controlled by any player from across the board. The Peacekeeper Bot and the Falchion Sentry Gun can be used to attack the Xenos while the Survivors stay at a safe distance, or they can simply create noise to draw Xenos away from more fleshy targets. As well as having new technology, these Survivors have new strategies at their disposal. They can take advantage of the Concentrate Fire technique to select a specific target and multiply their Damage value with the number of successes they roll. This is one of the most effective and one of the only ways of taking down Spoiler Abominations. The Survivors of PK-L7 are a long way from home, and as the Xenos close in, they have to wonder if they’ll ever get back. Zombicide: Invader introduces new weapons, equipment, and strategies, terrifying new opponents with strange mutations, and a brave group of Survivors trying to withstand the onslaught. With a faster setup-and-play time, streamlined rules, and a brand new setting, both fans of the series and people being introduced to Zombicide for the first time will find something to love. Zombicide: Invader is coming to Kickstarter on April 10 at 3 PM EST. Follow the CMON and Guillotine Games Facebook Pages for regular updates on Zombicide: Invader. 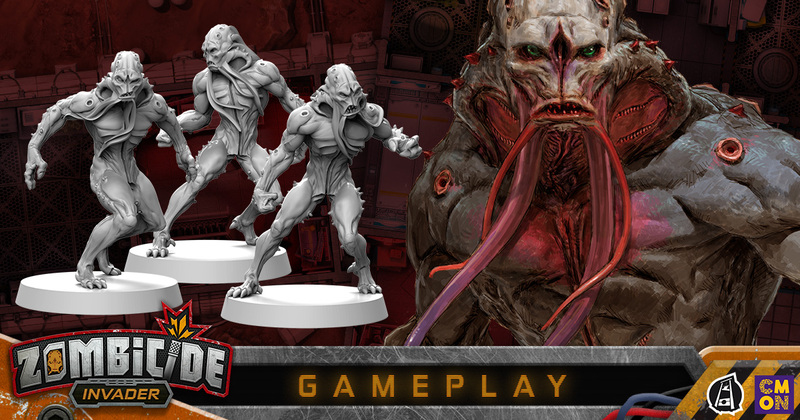 Read the Zombicide: Invader Design and Development article here.